This week is Petfinder's Adopt a Less-Adoptable Pet Week. Technically, Maxwell - as a deaf kitty - was less adoptable. We are so very glad he's in our lives! Allie: *giggle! * oh thank you! You have no idea how hard it is to get a good mani/pedi these days! 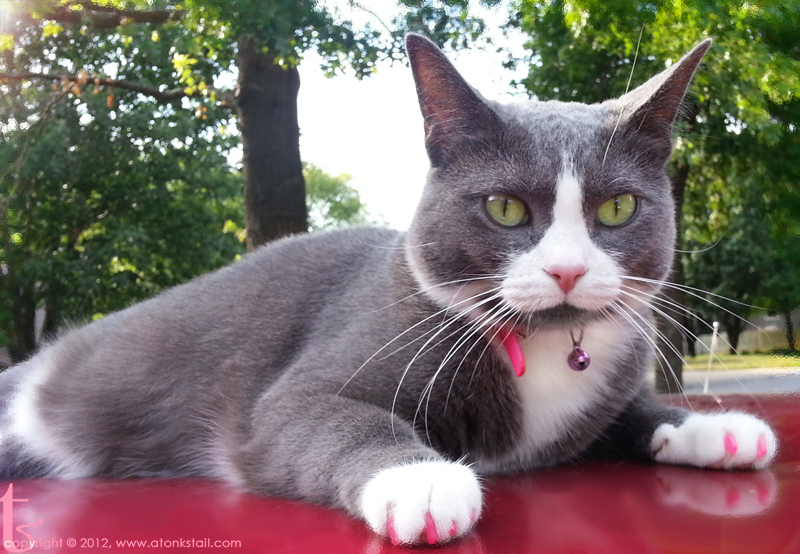 Looking good on wordless Wednesday. FaRADaY: oh now Allie's gonna be SO hard to live with... "Faraday! Pick up my mousie! My NAILS aren't DRY!" HMPF. All that pink - it's like having a spring flower on a nice fall day! We really really love your pink nail caps. Maxwell: *earnest look* we do too. Can you imagine how painful it'd be if she boxed my ears with sharp CLAWS? Funny....we thought that FaRADay was the less adoptable one. HA! ...just kidding...Adopt-A-Less-Adoptable-Pet Week is a WONDERFUL thing. All those kitties out there that aren't quite "perfect"....well, all they know is that they're cats, just like any other cats. And we think EVERYcat is perfect. Even FaRADay. FaRADaY: HEYYYY! Brat... right HERE! Listening to you TALK ABOUT HIM! Me and mom think that Adopt-A-Less-Adoptable-Pet-Week is a great idea ! We sure are glad Maxwell came to live with you. Allie: Me too. He's FAR more tolerable than The Brat. Maxwell: Thanks Miz Marg - Momma says I'm her special boy, and then she kisses both my ears. I like her kisses. She looks like a very happy kitty! FaRADaY: Oh she's usually not too happy. She's BOSSY. FaRADaY: Me too! He gives good BAFFS! We wish every "less adoptable" kitty was as blessed as handsome Maxwell. Allie is pretty in pink! Maxwell: *shy look* I think so too. FaRADaY: MOL! You go, Austin! Allie: Oh girlfriend! That's because you have a mind of your own! How sweet. We read your About US page. Your kitties are so pretty. We know you love Max as much as the others. What a sweeties. FaRADaY: Pffft, sometimes I suspect she loves him MORE. She's always making kissy noises over his ears. *huff* GURLZ. Yay for less adoptable kitties, and yay for deaf kitties, and yay for homes that dont care and figure out that 'less adoptable' usually means a great kitty! Maxwell's our peace-keeper. He gives Allie time away from The Brat, and Faraday love the fact that Maxie grooms him! OMC - we love your redid badge!! mom doesn't have those skills, but good job!! Maxwell: Dude. You do NOT rat out Momma on our own blog. That is one myth we need to bust! There are no less adoptable ones, only less wise humans. Allie: *giggle* ooooh a girl does need her spa days now and then doesn't she? That's what WE say! We feel lucky we got to him first - the rescue had NO idea he was deaf! And you are a very cute kitty! And as long as you like the puppies, you're all right with me. Maxwell: *blush* aw, thanks. I get along with everyone! Mommy tried to puts the nail caps on me - again. She has a new scar! Allie, you are so stylish and beautiful! Love the pink kitty caps!! Those pinkie nails are assorted to your collar! Very cute.